Verizon has a good thing going with its Droid branding for its lineup of Android-powered smartphones. The branding and advertising is distinctive (if, um, slightly disconcerting), and from all indications, the Droid-branded phones are selling well. Your Mac will say the word "Droid" using the built-in Cellos voice. As far as I can tell, the Verizon ads use the Cellos voice, though it may have been slightly altered in post-production. If you want to kick it up a notch, you can save this statement-of-robotic-self as an audio file. To do so, you have two options. One method is to use Automator. Open Automator (in the Utilities folder), and create a new workflow. Within Automator, do a search for the "Get Specified Text" action and drag it into the "Workflow" pane (the rightmost pane in the Automator window), and enter "Droid" into the text box for that action. 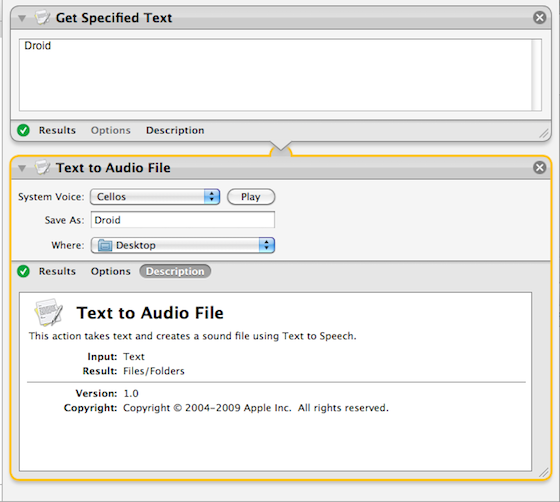 Finally, press the Run button in the upper-right corner of the Automator window; Automator will do its thing and spit out a .aiff audio file of the spoken text. This will save an .aiff file of the spoken text in your Home folder. From there, you can set this as your Mac's alert sound: Go to your "Home" folder, open the Library folder, and then open the Sounds folder. Drop the Droid audio file here. The next time you open the Sound pane in System Preferences, you'll have your ridiculously geeky alert sound. The HP Slate is a real product — numerous mentions from HP VPs and various leaks state that — but it’s far from “official.” Somehow, though, a somewhat-thorough video review was just posted on the ol’ Interweb for the whole word to see. Remember, this product is headed for the enterprise market and you can’t even buy it, so don’t get all flame-happy when you see with your own eyes that Windows simply isn’t meant to be controlled with you fingers. This demo is a laughable mess when it gets to the UI demonstration even though the person recording says the Slate is ”pretty responsive, pretty quick.” Yeah, alright. At least the hardware looks solid. Click through for the video and your first chuckle of the day. By Paul Miller posted Sep 23rd 2010 11:26AM So, Apple's talked about putting the iPhone on Verizon, Verizon wants the phone... why can't we get these two crazy kids together? Well, Verizon CEO Ivan Seidenberg touched on that topic in a talk to investors at the Goldman Sachs conference today. "We don't feel like we have an iPhone deficit. We would love to carry it when we get there, but we have to earn it," Seidenberg said, walking a fine line between complimenting the phone and making it clear that Verizon still has a good lineup. Ivan also mixed in a basketball analogy to sweeten the deal: "This is like the Knicks getting Carmelo Anthony. Like it would be very good if the Knicks got Carmelo Anthony. But they have to play the game whether they get Carmelo Anthony, right?" Ivan hinted heavily that Verizon's forthcoming 4G LTE network could be the golden ticket, and while this isn't a new theory, it's unclear (and a little disconcerting) if he's just as in the dark as we are as to whether or not Apple will come around once LTE is up and running. Still, he put on a brave face: "At some point, Apple will get with the program." Our suggestion? Bake Steve a cake. Couldn't hurt! By Chris Ziegler posted Sep 23rd 2010 5:42PM Sound familiar? For Windows Phone 7, seems like Microsoft's taking an angle shared by both Apple and Google on a feature that enjoys a tenuous relationship at best with network operators, saying that data tethering will be available but it'll be up to carriers to decide whether to offer it. Though feature removal rarely goes over well with potential buyers of Windows Phone 7 devices, it's actually a pretty easy call from Microsoft's perspective: the company needs as much carrier support as it can get right now to ramp up a fresh mobile platform going against entrenched giants with several years' head start, and enforcing the availability of a feature that tends to choke 3G networks probably wouldn't be a great way to get that. Needless to say, we've little doubt that the dev community will find a way around any roadblocks in short order -- but officially, anyhow, the ball is in the operators' courts. IRVINE, Calif. – Sept. 23, 2010 – Toshiba's Digital Products Division (DPD), a division of Toshiba America Information Systems, Inc., today announced the Satellite® L635 Kids' PC, Toshiba's first kid-centric laptop design, available exclusively at Best Buy. Designed in collaboration with Best Buy, the Satellite L635 Kids' PC is a full-size laptop made for children aged five to 10 that provides a suite of entertainment and education software and allows parents to help ensure their children are staying safe on the Web. Technology products are rising on the wish lists of families and are particularly popular as holiday gifts. About one in four parents reported plans to buy a laptop for their school aged children, according to a Toshiba survey that was conducted with Opinion Solutions, Inc., with nearly 74 percent reporting their kids ask for gadgets for the holidays. Parents want a reliable computer that also provides a safe environment for browsing the Internet, but their current options are limited to PCs made for adults or kid-friendly netbooks and toy-like computing devices. The Satellite L635 Kids' PC features a 13.3-inch diagonal HD display[i], a built-in DVD drive and Webcam with software designed specially with a younger user in mind. "The laptop has traditionally been a device conceived and built for adults, and devices currently being marketed to kids are either netbooks or toy-based computers," said Jeff Barney, vice president and general manager, Toshiba America Information Systems, Inc., Digital Products Division. "As a result of this collaboration with Best Buy, we have made a product that provides the right measure of fun and entertainment for children while meeting the computing needs and security concerns of their parents." The Satellite L635 Kids' PC is the latest consumer-driven innovation to come out of the You Spoke, We Listened program, a collaboration between Toshiba and Best Buy that has yielded products such as the Toshiba Satellite E205. With the Satellite L635 Kids' PC, the two companies combined their consumer feedback and technical expertise to produce a laptop from the ground up for children that is like no other. "People today expect well thought out laptop offerings customized to meet their expectations, and partnering with Toshiba makes it possible," said Jason Bonfig, vice president of computing at Best Buy. "We set out to design a laptop that better serves the function and content needs of families, and the result was the Satellite L635 Kids' PC." Since their arrival in fall 2008, products resulting from the Best Buy You Spoke, We Listened program have changed the dynamics of how computers and other technology are developed. Each generation originates with insight gleaned from sources such as Best Buy's own customers and employees into desired features, styling and performance. The company then works closely with Toshiba to translate those customer expectations into a unique laptop design that solves for customer needs with the right hardware and functionality. Designed with kids in mind, the laptop boasts a unique wipeable keyboard, allowing for easy cleaning of smudges left by messy hands and a no-gloss Dura-cross textured finish that helps resist fingerprints. The accompanying software gives parents the opportunity to help protect their kids from dangers online while providing a fun and safe universe for children to explore the Internet. 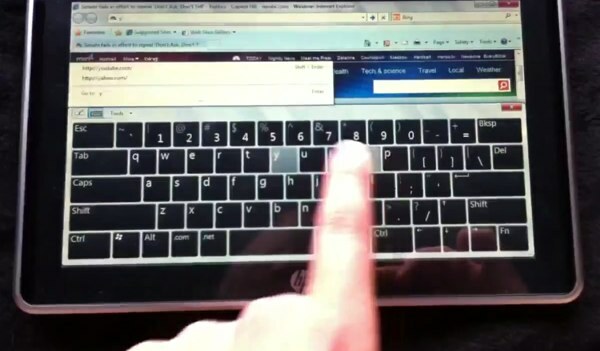 The laptop comes pre-loaded with KidZui, an Internet browser made for children, as well as Net Nanny, which allows parents to set boundaries on how the laptop is used. The combination of these two programs allows the security of the laptop to adapt as children mature. For all its kid-ready features, the laptop stands out for still having the power of a standard PC, making it a product to be used and enjoyed by the entire family. Pre-installed entertainment includes two Disney movies and the family-friendly LEGO Batman game. The Satellite L635 Kids' PC is available exclusively at Best Buy beginning Sept. 26, 2010. TAIS is an independent operating company owned by Toshiba America, Inc., a subsidiary of Toshiba Corporation. Toshiba Corporation is a world leader and innovator in high technology, a diversified manufacturer and marketer of advanced electronic and electrical products. These products span from information & communications systems; digital consumer products; electronic devices and components; as well as power systems including nuclear energy; industrial and social infrastructure systems; and home appliances. Toshiba was founded in 1875, and today operates a global network of more than 740 companies, with 204,000 employees worldwide and annual sales surpassing $68 billion (6.3 Trillion Yen). 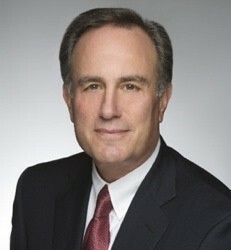 For more information on Toshiba visit www.toshiba.com. © 2010 Toshiba America Information Systems, Inc. All rights reserved. All product, service and company names are trademarks, registered trademarks or service marks of their respective owners. Information including, without limitation, product prices, specifications, availability, content of services, and contact information is subject to change without notice. 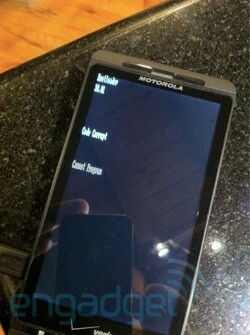 That picture above is no joke -- that's where I ended up last night trying to revive my Droid X review unit. It was fun, in a hacky mad-scientist sort of way, but it's also really sad -- a testament to how Google approves Android device hacking with a wink and a nod, but doesn't provide any safety nets for its most passionate users. Let's back up, though. How did I end up in such dire straits? It started when I had the nerve to update this Droid X to the leaked Android 2.2 build -- a simple process that involved installing the file on a microSD card and restarting. Unfortunately, since Motorola refuses to provide a sanctioned upgrade path from the leaked build to the official 2.2 build released earlier this week, I was forced to downgrade back to 2.1 to get back on track. Based on how easy the update was, this would be a piece of cake, right? Well, no. The original 2.1 build for the Droid X isn't actually available from Google, Motorola, or Verizon, so I was stuck wiping my phone and reflashing it entirely to a leaked build of 2.1, this time with the confidence-inspiring name of the "the_gift.sbf." Where did it come from, and what does it actually contain? I still have no idea -- but lacking any officially-approved options, I held my breath and restarted the phone in bootloader mode to begin the flashing process. Things seemed to be humming along, until, of course, the phone decided it had a dead battery in the middle of the flash and died. Oops. Yes, the two hours it took me to sort out the hacked flashing software had been too much for my poor Droid X's previously-full battery, and even though it was plugged in the whole time, it doesn't charge when it's in bootloader mode. I'd gone and bricked my phone. At this point there was nothing to do but take a picture and laugh -- things had gotten wildly out of hand. 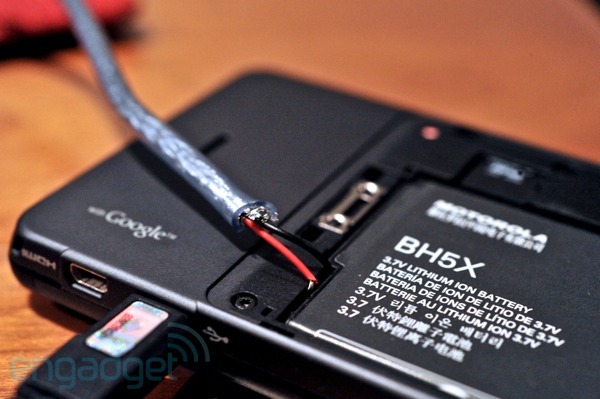 That's when I hit upon another forum post describing a way to trick the phone into thinking the battery was charged by splicing the power leads from a USB cable to the power terminals. It was late, I'd been drinking, I had a wire stripper handy... you all know what happened. Miraculously, it worked -- I got the phone to re-flash and boot into 2.1, although the flashing utility insisted that it had ultimately failed. (The battery also reported being 75 percent full, so I have no idea what the actual problem was.) Next thing you know, I was pulling the official 2.2. OTA update down, and hey -- we're back in business. Like I said at the top, I actually had fun doing all of this. It was interesting and nerdy, and, well, come on -- I totally got to hotwire a phone battery with a sliced-open USB cable while reflashing it with leaked firmware. High five. And a double high five for the Android community, which is about as enthusiastic and creative a group of people as I've ever encountered online. But hold up: I don't trust this phone at all anymore. I don't know anything about the system software I've installed or where it came from, and I have no idea what the leaked flashing utility actually did to it. I can't rely on a device that I don't trust. 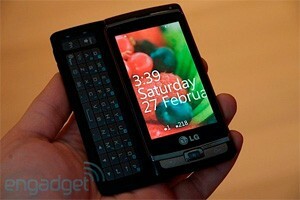 If this was my actual phone and not a review unit, I'd be completely screwed -- I need this thing to do my job. Of course, hacking any device carries its risks, and I definitely knew them when I installed that leaked build of 2.2. But Google goes on and on about how Android is "open," and the amazing Android community is a proud credit to how tinker-friendly the platform is at its best -- there's a cooked ROM for everything. We wait with bated breath for every Android phone to be rooted and hacked, and every time we review an Android phone and deduct points for a lame manufacturer skin we're repeatedly told by Android fans that it doesn't matter because "real" power users will just hack their devices anyway. Google has to know that its most passionate users are hacking its OS to hell and back -- it's become the defining strength of the platform. But hacking can definitely go too far, and Google doesn't provide any way for you to return to the original Android experience that shipped with your device -- you're at the mercy of the manufacturer and the carrier. Some manufacturers are better than others -- HTC provides updaters for many of its phones -- but some, like Motorola and Samsung, provide nothing at all. Once I left the reservation and installed that leaked 2.2 build, I was gone for good -- no official path back to the fold exists. That's not true on other platforms: if I was running a jailbroken iPhone, I'd just restore it with iTunes, and it would be factory-fresh with known software. That's simply not the case with Android, and it's a problem -- Google can't keep implicitly condoning Android hacking and trading on the enthusiasm of its community unless it requires manufacturers to provide restore tools for every device. Sometimes you just want to go home again. In my ideal world, consumers would be able to download official stock Android builds for their devices directly from Google, but I'm not ignorant of the carrier- and manufacturer-driven reality we live in. For better or worse, Android's only "open" until the carriers get their hands on it. But Google should insist that every Android manufacturer and carrier release images of their customized firmware for every device as well as tools for easy restoration. It's the only fair way to treat the people who are hacking the platform and giving it the amazing momentum it has, and the only fair way to continue promoting the platform as "open" when in reality the carriers and manufacturers are doing everything they can to lock it down. This is a problem not just because the site is down, but Facebook’s omnipresent Like button is also completely down, and so is Connect, and Platform — in other words, the entire Internet (or a good percentage of it) is feeling this pain. We’ve reached out to Facebook to see what is up. More to come. Until then, might I suggest you view the list of things to do when Twitter is down? It applies here as well. Current Status: API Latency IssuesWe are currently experiencing latency issues with the API, and we are actively investigating. We will provide an update when either the issue is resolved or we have an ETA for resolution. You’ll also note that they had the same issue yesterday for a few hours — and yes, there were a number of reports yesterday of Facebook’s site being down as well. We’re currently experiencing some site issues causing Facebook to be slow or unavailable for some users. We are working to resolve this issue as quickly as possible. Update 3: It appears that after well over an hour, Facebook is finally back. We can probably expect to hear more from them shortly about the cause of the problem. Secaucus, NJ, September 23, 2010 – Panasonic Solutions Company, provider of collaboration, information-sharing and decision-support solutions for government and commercial enterprises, today announced the newest member of its Toughbook® U1 ultra-mobile PC product family, the Toughbook U1 Ultra. All Toughbook U1 products combine the portability of a handheld computer, the benefits of a full Windows OS, the durability needed for enterprise applications and a suite of available integrated features. The new Toughbook U1 Ultra is equipped with a TransflectivePlus display for up to 6000 nit viewability in direct sunlight, 64GB solid state hard drive, 2GB of memory, an Intel® Atom Processor (Z530 1.6Ghz) and Windows 7®. The device is ideal for highly mobile jobs such as direct store delivery (DSD), eCitation and vegetation management in markets like supply chain management, public safety and utilities. 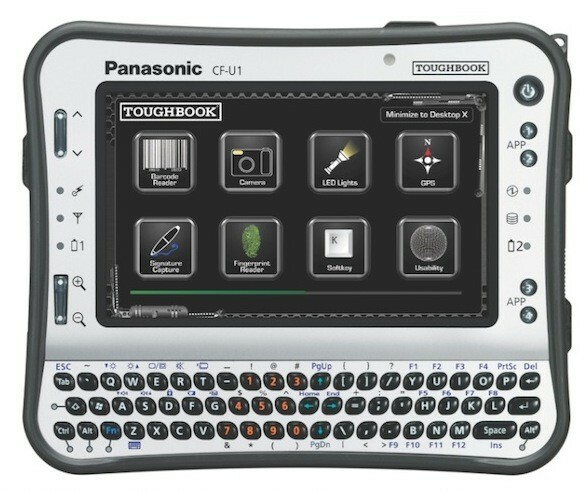 The Toughbook U1 family of handheld replacement computers has also undergone a number of usability and navigation enhancements, including enlarged screen icons, programmable "right click" onscreen button, a larger soft keyboard, a "zoom and pan" mode – allowing users to simply navigate robust content and a soft "Ctrl-Alt-Del" button for log-on on access. The optional 2 megapixel camera features updated software to offer faster auto-focus and improved white balancing, while the optional barcode reader has been improved with new software that allows for onboard, data and symbology configuration. Companies can also take advantage of the optional embedded features available for the Toughbook U1, including GPS, barcode readers (1D, 1D/2D), fingerprint reader and mobile broadband to drive greater levels of productivity. Besides being able to run the latest Windows 7 software, the Toughbook U1 Ultra is ideally suited to run legacy mobile device applications, with solutions available to run Windows Mobile and Windows CE software in the Windows 7 environment. The solution, tWinrunner™ by Clearview Software International, allows companies to maximize their legacy handheld device software investment while creating a migration path to a full Windows OS device. "The ability to provide your mobile workforce with a reliable, powerful and adaptable handheld computer running a full Windows OS is critical for organizations attempting to stay ahead of the competition," said Kyp Walls, director of product management, Panasonic Solutions Company. "Relying on a single-purpose device that runs a pared-down or proprietary OS is no longer acceptable in environments where information is critical and computing solutions must deliver a clear ROI. The Toughbook U1 Ultra, running Windows 7 and incorporating an impressive list of available integrated features, is the ideal handheld mobile computing solution for companies with an eye on future success." The Toughbook U1 line up is certified by an independent third-party test lab to meet MIL-STD-810G and IP65 standards for environmental conditions. The device can withstand a drop of 6 feet from any angle, and its fanless design keeps out water and dust while reducing weight and eliminating a common point of failure. The Toughbook U1 family includes a variety of embedded wireless technologies, including Wi-Fi 802.11a/b/g/n, Bluetooth® 2.1 and optional Gobi2000™ mobile broadband technology from Qualcomm. Gobi simplifies complex multi-carrier wireless deployments for IT departments and allows mobile employees improved connectivity options while traveling at home or abroad. The Toughbook U1 will be certified on the Verizon Wireless, Sprint and AT&T Wireless networks, allowing workers to stay connected at all times. "The market for field mobility solutions is currently at a crossroads where field mobile workers are being tasked with an ever expanding list of requirements," said David Krebs, director of the mobile and wireless practice at VDC Research. "As a result the mobile computers deployed to support these work flows need to be designed to not only maximize performance but also to be delivered in a highly ergonomic and portable package. Panasonic's next generation U1 handheld device - including its full Windows OS and its myriad integrated I/O and communications options - addresses these requirements with a functionality and performance optimized design." With the introduction of the Toughbook U1 Ultra, the product family now includes two devices to meet varying mobile workforce needs. The Toughbook U1 Essential (original Toughbook U1) features the Windows XP OS, up to 32GB SSD, 1GB RAM, a 300nit transmisive display and an Intel Atom (Z520/1.33GHz) processor. The Toughbook U1 Essential is suited for basic mobile computing needs and is an ideal alternative to Windows Mobile ruggedized PDAs and handheld devices. The Toughbook U1 Ultra is also available with an optional 29-key numeric keypad for quick data entry and easy navigation. The numeric keypad also has a single "Ctrl-Alt-Del" button, making one finger operation simple while on the move. The numeric keypad is ideal for warehousing and forklift-like applications where high volume quantity input is useful and for other users that find the QWERTY keyboard unnecessary. The Toughbook U1 Ultra is available in the United States starting at an estimated street price of $2,799. The Toughbook U1 Essential is available in the United States at an estimated street price of 1899. Both devices can be purchased through authorized Panasonic resellers and distributors. All Toughbook mobile computers include a standard three-year limited warranty. A video overview of the Toughbook U1 Ultra can be found on the Toughbook brand's YouTube channel; images of the Toughbook U1 Ultra can be found on the brand's Flickr page, and a post discussing Windows 7® and the next generation of rugged handheld devices can be found on the brand's blog - Toughbloggers.com. For more information on the Toughbook U1 and other Toughbook mobile computers, go to www.toughbook.com. Panasonic Solutions Company empowers people whose jobs depend on reliable technology. The company delivers collaboration, information-sharing and decision-support solutions for customers in government, healthcare, education and a wide variety of commercial enterprises. Products and services within the company's portfolio include Panasonic Toughbook® mobile computing solutions, projectors, professional displays (including both plasma and LCD), and HD and 3D video acquisition and production solutions. As a result of its commitment to R&D, manufacturing and quality control, Panasonic is known for the reliability and longevity of its products. Panasonic Solutions Company is a Division of Panasonic Corporation of North America, which is the principal North American subsidiary of Panasonic Corporation (NYSE: PC). HP has done plenty of its own teasing of the HP Slate, but in-the-wild spottings are few and far between. Now our favorite YouTuber and yours, x313xkillax, has a video of an HP Slate prototype. (There's some speculation that this is a fake, but from everything we know about the tablet we're pretty sure this is the real deal.) The hardware looks similar to what we've seen before, though perhaps a bit further along than version Conecti.ca "reviewed" back in April. We're pleased with the boot time of the device and seemingly fine Flash performance, and x313xkillax calls the touchscreen very responsive, but as you can see in the video after the break, Windows 7 still isn't really designed for finger operation. Just like HP seemed to realize when it bought Palm and bumped this tablet from a consumer launch to a niche enterprise product. Nvidia’s GPU Tech Conference is evolving to have an even stronger emphasis on high performance computing than the past couple of years. Yes, there are token nods towards the consumer side of the business--Cyberlink is at the show, demoing 3D Blu-ray--but that’s about it. PNY is here, but showing its Tesla and Quadro based professional solutions. Even the papers leaning towards more practical uses tend to seem academic. Take, for example, “GPU Accelerated Marker-less Motion Capture.” This is a Stanford University project that addresses how to accurately capture real-life motion of humans and animals without having to attach pesky, reflective markers. This is useful in animation and movie making, but could also prove useful in surveillance applications, but it sure sounded dry. Similarly, “Real-Time Particle Simulation in the Blender Game Engine with OpenCL” is from Florida State University, but it’s really aimed at people learning techniques for building more realistic games. It’s clear that Nvidia’s emphasis for the GPU Tech Conference is on the “tech” in the title. Unlike the Intel Developer Forum, which is more targeted at building the entire ecosystem for all Intel products, the core emphasis at GPU Tech Conference is on high performance computing. I notice that in the keynote, the atmosphere was more muted. There was cool stereoscopic 3D stuff, most of the time was taken up with relatively esoteric discussions of ray-traced renderers, details about physical simulation using ANSYS and several other interviews in a similar vein. Gone were the punchy jibes at competitors from Jen-Hsen Huang that have punctuated the news coming from past GPU tech conferences. Maybe that’s how it should be. As Nvidia responds to competitive pressures, it’s natural to move into areas not served by competitors. AMD’s graphics group certainly has some presence in professional graphics through its FireGL line of graphics cards, but its penetration into the compute segment served by Nvidia’s Tesla products is miniscule. Intel’s Sandy Bridge CPU line, slated to ship early next year, will put pressure on Nvidia’s entry level GPU products. Consumer level applications, like video transcoding, will be very well served by Sandy Bridge. At least one observer commented that Sandy Bridge’s video encoding is much faster than anything by Nvidia and possibly better quality. If Nvidia can’t compete with entry level, it’s natural to move higher up in the product food chain. And although the tone this year seems more sober and serious, it’s also a more mature tone. Announcing a road map that goes out for three more years implies a fairly rigorous product planning process – although once again, that roadmap focused on GPU compute – no roadmap of the mobile Tegra processor line was evident. As Nvidia, AMD and Intel jockey for position in the various market segments for visual and high performance computing, it’s increasingly clear that Nvidia is also dependent to a great degree on Intel. 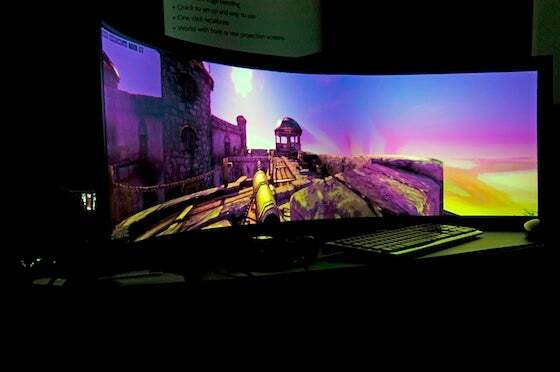 Intel logos were quite visible at a number of booths in the GTC trade show, and Huang suggested that the CPU and GPU would not only co-exist, but co-operate in the high performance compute space going forward. 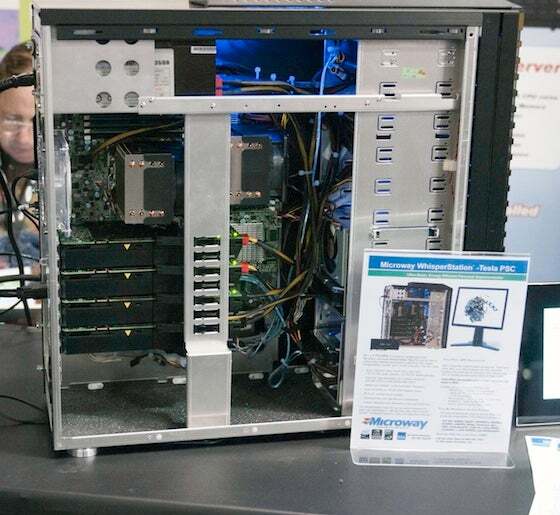 Perhaps the final irony at this year’s GPU Tech Conference was the tiny booth occupied by SGI. 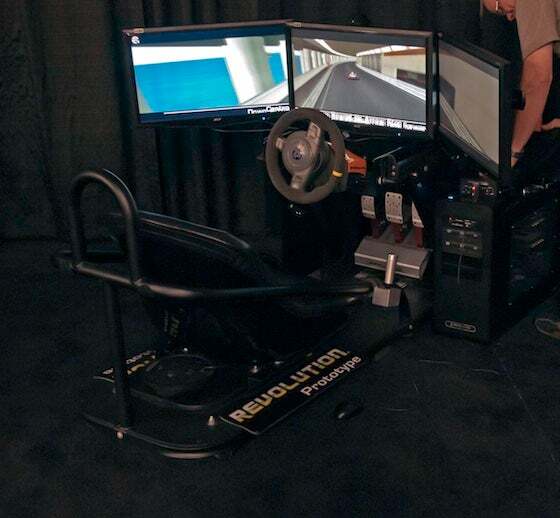 The former workstation giant, at which many of Nvidia’s leading architects and engineer cut their teeth years ago, is now an outlet for Tesla-based compute servers. SGI’s presence is perhaps a sobering reminder of how even high flying tech giants of the past may one day be just a small exhibitor depending on some upstart’s product line. This Saturday, hundreds of hackers, designers, and entrepreneurs are going to descend upon the San Francisco Design Center Concourse for the TechCrunch Disrupt Hackathon. There will be pizza, caffeine, beer, and MacBook Pros as far as the eye can see. Most of the participants won’t leave (and many won’t sleep) until 11 am the next day, when each team will have 90 seconds to present what they’ve created to our expert panel of judges. This demo session is free and open to the public, and it’s really something to see. An analogy: if the Startup Battlefield at Disrupt is “Who Wants To Be A Millionaire”, this demo session is “Jeopardy!”. No frills, no extras, no lifelines or waffling over whether to take the money, just pure unadulterated content. Wow us in a minute and a half and let’s move on to the next one. The winner gets a spot on stage at Disrupt. And of course, if you’re not really the spectator type, there are still a few slots left to actually participate in the Hackathon, so sign up here for your shot at presenting on stage at Disrupt. Once upon a time, Microsoft backed a format called HD DVD and, well, that didn’t turn out so well. But the departure from focusing on high-density physical media early on might have forced Microsoft — and the Xbox team — to look towards digital downloads for future products. UK Xbox chief, Stephen McGill, seems to agree and recently stated to gaming site Xbox Achievements that “People now recognize what a smart decision it was to keep the [Xbox 360] pricing low,” in reference to not including an advance optical format within the Xbox 360. Then he goes on to properly slam the Blu-ray format. On Tuesday, Nvidia announced it was going to support x86 processors as a target for CUDA applications. This means that apps that are currently written to support Nvidia’s GPU line for compute applications will be able to run on standard x86 CPUs--no GPU needed. Today, I spoke with Mathew Colgrove of The Portland Group. The Portland Group specializes in compilers for high performance, parallel computing applications. A subsidiary of ST Micro, Portland Group focuses mostly on a version of Fortran designed for multiprocessor systems. As a programming language, Fortran is still heavily used in the scientific computing arena, and leans heavily towards making procedural computation – it’s not meant to be a general purpose language like C or C++. Colgrove noted that the initial version of the x86 CUDA Fortran would focus on multiprocessor AMD and Intel CPUs, and take advantage of the latest versions of SSE for floating point. He also said that they had working simulations of Intel AVX (advanced vector instruction) versions of the compiler in the lab. So when Intel ships their Sandy Bridge CPUs with AVX support, parallel applications should see a substantial performance boost. I also asked Colgrove if AMD GPUs could be targets for CUDA applications, but he replied that they had no plans to support AMD’s GPU line. “We’d love to be able to support AMD GPUs, but we’d need a lot of support from AMD, something that hasn’t been forthcoming. Supporting both Nvidia GPUs and x86 processors will eventually allow applications developers to build software with a single binary that can run on mixed systems (x86 + GPU) and systems that lack GPU hardware. It’s interesting that Nvidia would lend a hand to this effort. While CUDA apps will likely run more slowly on x86, CUDA’s proprietary nature has been something of a competitive advantage for the GPU-oriented company. Given emerging standards for compute APIs, like OpenCL and Microsoft’s DirectCompute, perhaps Nvidia felt it needed to support other processor technologies to avoid being left behind.